Salvador Sotelo says the apartment below him is unoccupied — but his landlords claim they've been living there. When Salvador Sotelo moved into the bottom floor of a duplex across the street from BART’s West Oakland station in 2003, he counted himself lucky to find a rent-controlled unit for just $1,000 a month. Seven years later, in 2010, Sotelo’s family switched to the top unit of the same Center Street duplex, and his landlords, brothers Rong Fu Lee and Rong Dong Lee, only raised his rent to $1,100. But then, rents in the neighborhood started climbing, by double-digit percentages each year, as West Oakland began its transformation into a bedroom community for more affluent newcomers. Now, his landlords are asking for $3,000 a month — and if he can’t pay, they’re threatening to evict. Sotelo and his pro-bono attorney, Leah Simon-Weisberg of the nonprofit Centro Legal de la Raza, say that he and many other Oakland renters are imperiled by what they call a “loophole” in the city’s rent-control laws. Specifically, Oakland's rent adjustment and just cause ordinances exempt buildings with three units or fewer from rent control and just-cause protections if a property owner lives in one of the units as a primary residence. For Sotelo, this means that his landlords can set the rent as high as they want on his normally rent-controlled unit, as long as they can prove that one of them lives in the duplex. Rong Fu Lee, who manages the building on a day-to-day basis, claims to live in the bottom unit. But Sotelo insists that the Lees have never lived in the building, and that it’s all a charade to push his family out. It all started in 2014, when Sotelo says he asked his landlord to make repairs. Lee allegedly refused, and so Sotelo filed a petition with the city for a rent reduction. A hearing officer ruled in Sotelo’s favor, but his landlords appealed the decision, which they lost. Shortly after, Sotelo received a notice from Rong Fu in February 2016. It stated that, since the landlord had been living in the bottom unit since September of the previous year, Lee would be raising the monthly rent to $3,000 a month on January 1, 2017. Sotelo and his wife, immigrants from El Salvador, clean houses for a living. He told the Express that, together, they sometimes manage to earn around $2,000 a month. The Lees did not respond to repeated requests to discuss the rent increase, and the Lees’ attorney, William Lynn of Fried and Williams, also declined to comment. Sotelo says his landlords are now monitoring him with cameras. In the front window of the bottom unit, for instance, there’s a long strip of reflective plastic, which looks like wrapping paper. This strip covers the top part of the window, and beneath it hides a small camera, which faces the stairs that lead up to Sotelo’s unit. “They’re watching you,” said Simon-Weisberg while examining a second camera, which faces the street. Meanwhile, it’s impossible to see inside the downstairs unit, and when the Express visited last week no one appeared to be home. Sotelo says his apartment has a history of problems. He described water that leaks through gaping holes in the gutters, and how, rather than replacing them entirely, his landlord only patched the holes with sheet metal. Because of this, water leaks into the walls, allegedly causing black mold to grow in one of the bedrooms. In the closet, which was converted from a half bathroom years ago, hangs a plastic pouch filled with silicon desiccant to absorb water that seeps through in the air. In the kitchen, there’s also a large, white trash bag, bursting with clothing that Sotelo claims was ruined by the mold in the closet. When he asked the landlords to clean the mold, Sotelo says they only covered it with white spray paint. City records support some of Sotelo’s claims. In December 2013, an inspector verified that there was mold growing in the walls and leaks in the roof. The mold, he believes, caused the lung problems for his family, which started seven years ago. At first, he and his wife thought they were having allergies, until a Highland Hospital doctor told him that his lungs were damaged, and gave he and his wife inhalers. His children also have lung problems, and all except for one have moved out. Records indicate that the Lee family owns seven properties in Alameda County, including six rentals in Oakland and a single-family home in Fremont. The parents, Siu Kuen Lee and Yan Hua Lee, were the former owners, with their sons taking over all their properties in 2012. Whether or not Rong Fu actually has lived in the downstairs unit for the past several years, tenant advocates say that owner-occupied exemptions are sometimes abused by property owners who are simply after higher rents. According to Igor Tregub, a Berkeley Rent Stabilization Board commissioner, false owner-move ins and owner-occupied exemptions are increasing in the East Bay as a tactic to push out existing tenants and raise rents. Other cities such as Berkeley and San Francisco have better protections, he said. But Oakland tenants, he said, have fewer resources to fight back, or to find new housing if they’re displaced. Lisa Greif, a housing attorney for Bay Area Legal Aid, said that Oakland’s owner-occupancy exemption may have been created with the best of intentions, such as to help mom and pop landlords. She conceded that small landlords, who live in buildings with fewer than three units, may not necessarily be making the same kind of money as major property owners in the Bay Area, and so might need more rights. But Greif explained that, while tenant protections in Oakland exist, enforcement and tenant education is still a major problem. “I’m not sure if a lot of tenants know about the [Oakland] rent board or what their rights are,” Greif said, adding that, even if landlords do educate tenants, it’s often in English, rendering the information useless for non-English speakers. Enter the Sotelos, whose first language is Spanish. However, they are currently fighting their rent increase before an Oakland Rent Adjustment Program hearing officer. On a recent Thursday morning, the Sotelos and Lees crowded into a large conference room to make their cases. Sotelo explained that he’d never seen the Lees show up with furniture to move into the bottom unit. 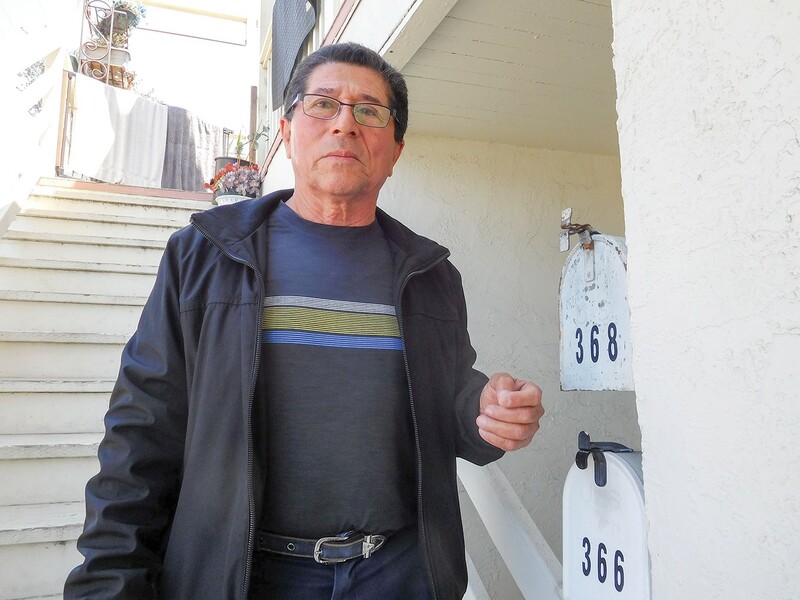 One day in March 2016, when an East Bay Municipal Utility District employee came by to read the water meter, Sotelo described how they began talking about the rent hike and eviction. The EBMUD employee allegedly told Sotelo that he doubted anyone lived downstairs, because the unit had used virtually no water for months on end. Sotelo snapped a picture, which was included as evidence in a thick case file. Sotelo also claimed the Lees starting delivering trash to the property in late 2015, in order to make it appear as though someone lived downstairs. “I saw them bringing garbage from another place and putting it there,” he explained. Sotelo even took video of the Lees driving up with bags of trash and putting the trash in the can for the downstairs unit. The Lees presented their counter-argument. They showed the hearing officer hundreds of receipts from the nearby 99 Cents Store, which they say are for goods bought by Rong Fu while he has been living in the building. Their attorney also quizzed Sotelo. “Can you see inside [unit] 366?” attorney Lynn asked. “It’s obvious!” Sotelo responded. He later told the Express that no noises ever come from the downstairs unit, and that, since he has been on disability leave and has been staying at home, he rarely ever sees his landlords, except in the mid-morning several times a week when they arrive by car from somewhere else. This is not the first clash Sotelo says he has had with the Lees. He claims that, beginning in 2013, Rong Fu would bang on his door the morning of every first day of the month, yelling and demanding that month’s rent. His neighbor across the street, he says, has witnessed these encounters and was the first to urge Sotelo to get legal help. Sotelo claims the Lees even told him he was not allowed to keep his cat, who prowls the apartment and the balcony area. Simon-Weisberg said there is no prohibition against cats in his rental agreement. His youngest children, he says, moved away in part because they couldn’t stand his landlord’s harassment any longer. Even Sotelo says that he isn’t sure how much longer he can live with his landlords putting pressure on him. His case is ongoing, but Simon-Weisberg says that, even if they win, his landlords could just restart the clock and move to evict him all over again a year later, by using the same just-cause exemption in Oakland’s law.